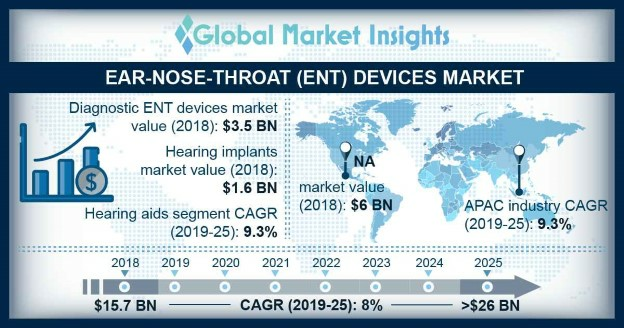 ENT Devices Market size is set to exceed USD 26 billion By 2025; according to a new research report by Global Market Insights. Elderly people are likely to suffer from hearing loss, throat infections, sinusitis and other infections due to anatomic changes that results in functional disability. Hence, rising geriatric population will act as driving factor for ENT devices market. According to, WHO statistics, it is estimated that approximately 33% of population over the age group of 65 years suffer from hearing loss and deafness. WHO states that the prevalence is highest in South Asia, Sub-Saharan Africa and Asia-Pacific region. Geriatric population prone to nasal infections raises the demand for sinus dilation devices and endoscopes utilized during surgical procedures. Thus, rising demand for various implants, sinus dilation devices will augment the ENT devices market growth during the analysis period. Technological advancements in hearing aids and ENT devices such as hearing implants will propel the industry growth. Recently developed hearing devices are invisible & available in small sizes, connected to ear by thin invisible tubes. This proves beneficial for the industry growth as it helps in resolving the social stigma prominent in adult and teenage population suffering from hearing loss. Also, advancements in hearing aids such as introduction of invisible in canal (IIC) devices that delivers natural as well as more clear sound with low power requirement. Moreover, superior quality surgical equipment and devices developed by key industry players will positively influence the business growth. For instance, Medtronic has developed surgical devices for ENT segment such as ontological burrs and drills that provides accuracy in surgeries. Additionally, technological advancements in endoscopes include auto endoscopes and capsule endoscopes that influences and encourages customer buying behavior and results in increasing the revenue size of diagnostic as well as surgical ENT devices. However, increasing cost of ENT devices will impede the market growth. Hearing implants segment was valued at USD 1.6 billion in 2018 and expected to have considerable revenue size during analysis timeframe. Increasing use of implants in children with impairments in aural senses will prove beneficial for the segmental growth. Also, frequent introduction of novel implants is expected to boost the business growth. Cochlear implants are most popularly used implants, that bypass the mechanism of cochlea and arouse auditory nerves and availability of efficient cochlear implants will drive segmental growth. Also, advancements in middle ear implants provide various applications in hearing loss and used in treatment for outer ear infections, earmold allergies. Thus, increasing demand for middle ear implants will augment the overall segmental growth. China ENT devices market witnessed 10.7% growth during the analysis period and is expected to witness enormous growth in near future. Growing prevalence of hearing impairment among geriatric population coupled with developing healthcare infrastructure will drive Chinese ENT devices market. Also, various awareness campaigns and programs such as China’s national Ear care day to raise awareness about hearing tests and treatment will positively impact the industry growth. Eminent industry players operational in global market includes Atos Medical, Cochlear Limited, GN Hearing, Rion, Siemen’s Healthcare, Sonova, Starkey Hearing Technologies, Welch Allyn, Widex, William Demant. These industry players adopt strategies such as new product launch, mergers and acquisitions to maintain their market position. For instance, in June 2016, William Demant launched Oticon Opn, the most advanced hearing aid solution. Introduction of new products will enhance firm’s product portfolio.